I was playing with my new Silhouette SD cutter but needed a reason to make a card for. My husband gave me the name of one of his co-workers (Courtney) that was having a birthday, so I made the card for her, and it turned out my sons girlfriends birthday (Laura) was just around the corner so I made her one too. 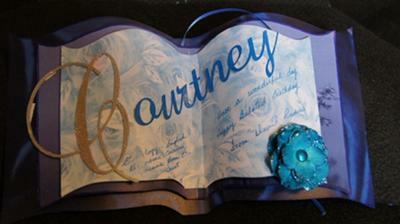 Book cards are always very popular and they can have as many leaves to the book as you wish. There are several ways to make them and this one is lovely. The blue is so vibrant. You can find another style of Bookcard in the Papercrafts section in the NavBar to your left. Another popular way to make them is with an embossing board and the most famous one I know is from The Glitter Girls. The Bookatrix Board is used all over the world and the results are really stunning. Lovely card, well done. It is fun trying new things.